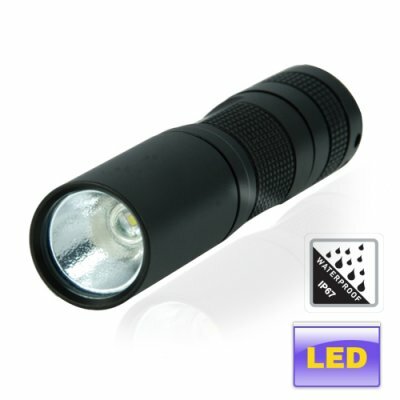 Successfully Added Megastar G75 CREE LED Torch Light - Premium Grade LED Flashlight to your Shopping Cart. New mini torch light with five lighting functions and featuring high-power CREE XR-E Q3 white LED. Die cast metal body, rubber o-rings, anodized finish, watertight design, and bright white CREE LED all in one little flashlight - welcome to the Megastar G75! So how does the Megastar G75 work? Button presses of the weathertight rubber "tail clicky" give you a alternate levels of light (from low to high) along with two types of strobe flashing. With its thoughtfully designed casting and high power LED emitter, this is a handy companion for every handyman or outdoorsman that needs a bright lighting from a small sized light source. Whether you need a small light for seeing in tight spots, or just need a high output mini flashlight to keep on the lanyard by the back door, the Megastar G75 has got you covered. In stock right now for two piece or bulk stock orders, get yours today! Can be powered with standard AA batteries or better yet rechargeable NI-MH batteries. I see this flashlight is IP67 rated, so can I take it scuba diving? NO. While this is a water proof model, it is not dive rated and should not be submersed for extending periods of time. Some white LED flashlights on the market claim 100,000 hours rated life. How come yours are only rated 50,000? There are no such thing as 100,000 hour life white LED's. Worldwide accepted certified lighting labs estimate a usable life of 50,000 hours from commercially available white LED's. And even this figure is just extrapolated from degradation after 2,000 hours. Nevertheless, 50,000 hours of life from a torch light will provide you with a lifetime of use. I own this spotlight since a year and I am a flashhaholic, but this is the best 1xAA of my collection. Very good built quality and spot. The same of another well-know spotlights 3x expensive. You can beleve 120 lumens rated and runtime. on 2009-09-14 02:38:25 a must have product !!! indeed very strong lightness !!!. massive making. only one exception. the button is not so exact when you want to choose one of the five modes. you need to retry.